Sound planning today can be worth more than a lifetime of work. For some, financial planning has been seen as a sales tool, an add-on to investment and insurance products; portfolio management; employee benefits; and estate, retirement and tax planning. We believe the reverse is true. 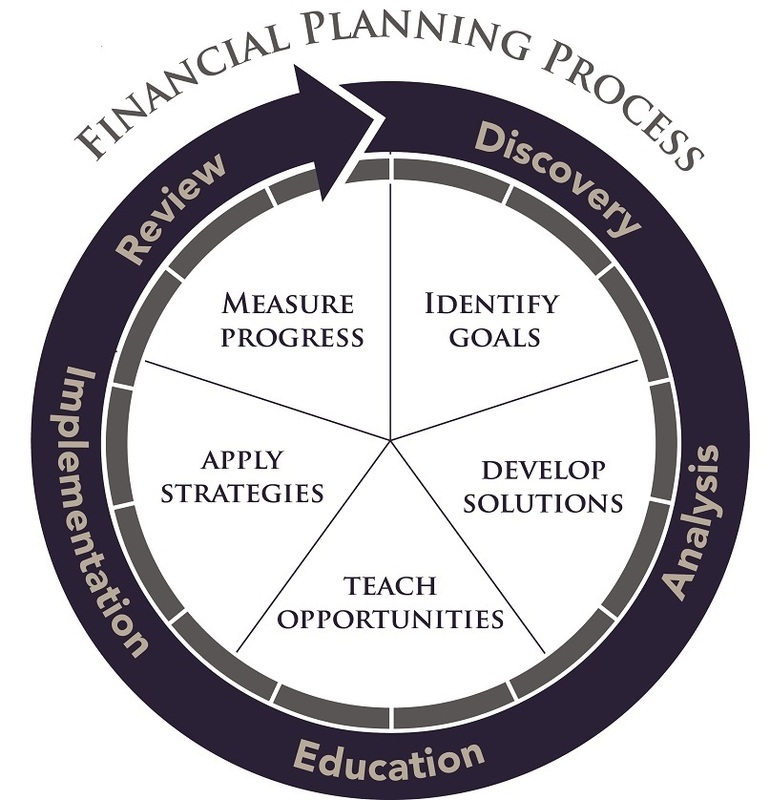 Financial products and services should be put into practice and viewed upon as components of, and the recommendations of, a comprehensive financial planning process. Our aim is to facilitate a forward-thinking planning process where clients, with the help of their trusted advisory team, are highly motivated to accomplish their biggest goals, achieve all of their desired results and establish a clear vision and mission for the future; all with an unwavering sense of clarity, purpose and confidence. Many people have financial products purchased one by one over the years. They end up reacting to events rather than designing, implementing and sustaining a financial plan. Our purpose is to help you make such a plan and then guide you through the completion of that plan, year after year. Our planning approach combines discipline, prudence and due diligence with a systematic process. The following is an outline for each meeting. We realize that additional meetings may be needed depending on your situation. At the start of our journey we want to ensure that we are compatible. This initial interview will allow us to get acquainted with each other. Here we can determine how or if we can be of service to you. We will invest time in the beginning of our relationship to ensure that our firm’s values and expectations align with what you are seeking. A good answer to the wrong question may be interesting… but it will most likely be ineffective and expensive over time. We believe that the first step in developing an intelligent and successful plan begins with a foundation of understanding what is most important to you. Long before we will formulate strategies or offer any specific advice it is important that we understand both the financial and personal aspects of your life. Here we build a meaningful picture of what is most important to you - your vision, values, priorities, hopes, dreams, goals, aspirations, opportunities, strengths, attitudes, philosophies, preferences as well as any challenges and concerns you may be experiencing. Next, we will take a snapshot of where you are today financially. A fundamental part of helping you bridge the gap from where you are today to where you want to be in the future is to gain an in-depth understanding of how your financial resources are positioned. In order to properly study, analyze and prepare a personal game plan for you, we will need complete and accurate financial disclosure. Once we have learned what is important to you and gathered all the relevant financial data, we begin the strategic thinking and planning component. Our planning team begins to align your goals and objectives with your current financial position. They will carefully review, study and analyze your personal situation to see if you have any gaps and omissions in your current planning affairs. At this stage we present you with detailed recommendations and a number of alternatives aligned with your goals and objectives. Each recommendation is carefully researched, deeply informed and based on relevant financial data and practices available to help you arrive at the next best step. Dreams about retiring early may turn into plans for never retiring at all, if we can help make your work more rewarding. Ideas for distributing your estate may turn into plans for establishing a lasting legacy. In other words, our recommendations may do more than surprise you. They might even change your life. After we’ve discovered what’s important to you, made a plan for achieving it and put into practice the appropriate steps what’s left? Only the good part: Living. We work together to help ensure our clients see new directions in their lives. One of the goals is to renew commitment and vitality in those areas that have been overlooked. Effective and focused planning will help you release financial worries and remove the headaches of complexity. This can help create purposeful living and greater clarity of what’s down the road, ultimately amplifying the freedom of living. Planning is a journey, not a one time event. Since life itself is a process of discovery, we keep tabs not just on your financial resources, but on your changing circumstances. As time goes by and your goals and priorities change, we will be there to help ensure your financial plan keeps pace.